Effect of dome-to-neck ratio on the need for adjunctive devices in endovascular management. 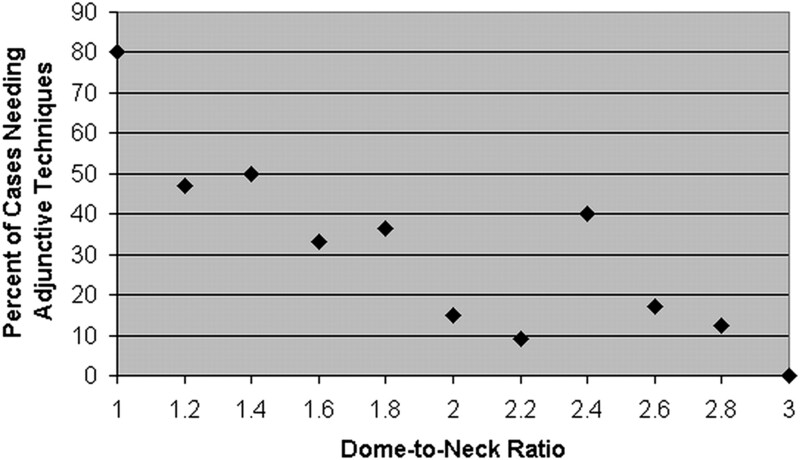 This graph demonstrates the influence of dome-to-neck ratio on treatment decisions. For cases with dome-to-neck ratios <1.6, adjunctive techniques were used in most of them, whereas for cases with dome-to-neck ratios >1.6, aneurysms were treated without adjunctive techniques in most of them. Effect of neck size on the need for adjunctive devices in endovascular management. 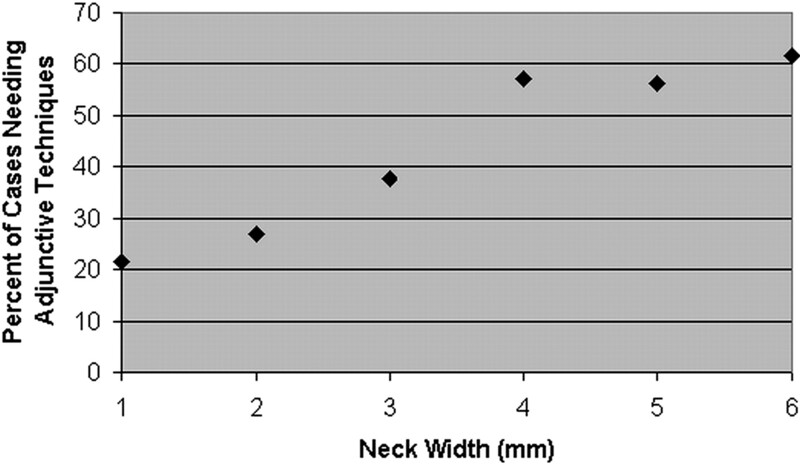 This graph demonstrates the influence of neck size on treatment decisions. For a neck size <4.0 mm, coiling without adjunctive techniques was favored over coiling with adjunctive techniques. At a neck size >4.0 mm, this was no longer true. Effect of aspect ratio on the need for adjunctive devices in endovascular management. This graph demonstrates the influence of aspect ratio on the need for adjunctive techniques. 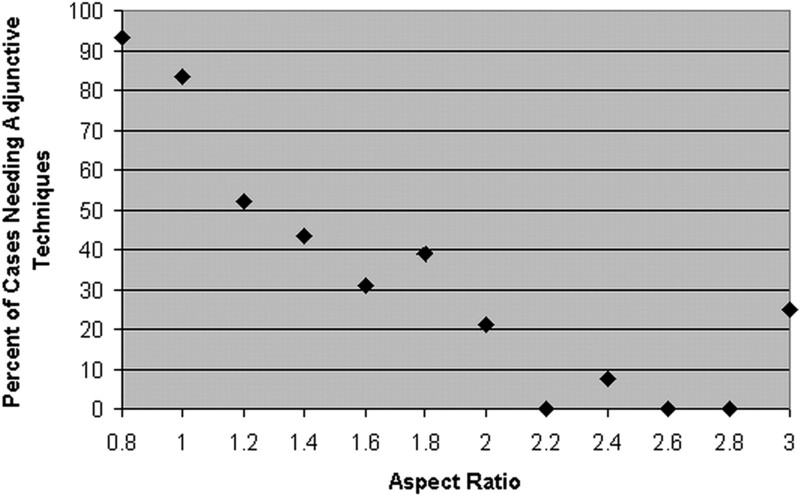 Most cases with aspect ratios <1.4 necessitated adjunctive techniques in their management; however, statistical significance was attained at an aspect ratio >1.6. Coiling of middle cerebral artery aneurysm. Images show the successful coiling of a middle cerebral artery bifurcation aneurysm without adjunctive techniques in a 50-year-old man. A, This aneurysm has an unfavorable dome-to-neck ratio (1.3), an unfavorable neck width (5.0 mm), and a favorable aspect ratio (1.8). Given the low dome-to-neck ratio and large neck width, this aneurysm would have been considered not amenable to coiling without adjunctive techniques. B, Immediate postoperative image of the aneurysm shows near-complete coiling with a small neck remnant. 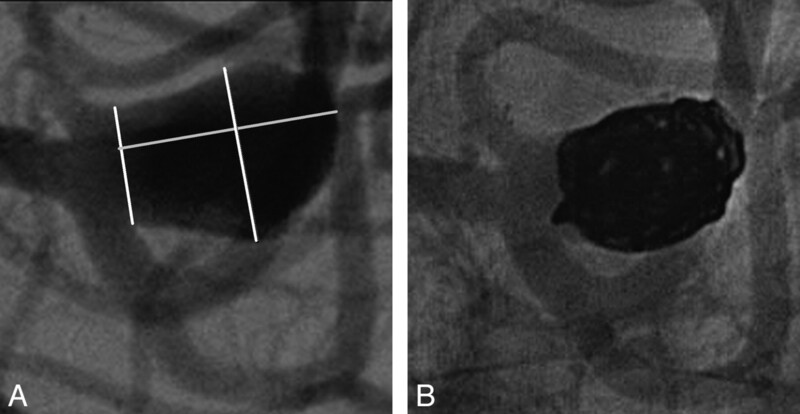 You are going to email the following Difficult Aneurysms for Endovascular Treatment: Overwide or Undertall?